If you're tired of seeing ants in your home, trailing from the door to the kitchen in search of tiny specks of food, your best bet is to learn about the different types of ants and how to get rid of them. Chances are, you have one of the nine most common types of ants found in and around the home. Follow the ants' trail to identify the path they follow, even if you can’t find out where the ants are coming in. Place ant bait stations along the trail you identified, following all label directions. The workers will find the bait, carry it back to the nest, and feed the queen, eliminating her and future populations. If the ant trail leads you to an outdoor, below-ground nest, drenching the nest with an approved insecticide spray (following all label directions) can be effective. Note: Do not spray indoor ants, as you will just kill the workers, and more will be sent out to forage. Trim trees and shrubs away from the home, and caulk all wire and cable penetrations through exterior walls. Remove or repair aging or decaying wood on or around the home. Apply a granular or liquid insecticide to an area about 2 to 4 feet wide all around the perimeter of the home, using a product labeled for controlling carpenter ants. It's usually best to apply the insecticide in the spring and fall. Find the carpenter ant nest(s), and apply a chemical insecticide directly into it and along its tunnels and trails. However, because there can be multiple nests, it can be difficult to locate them all, particularly the main nest, which is often outdoors. Place insecticide baits labeled for carpenter ants in areas where they travel. Keep the ants out of your house in the first place trimming back trees and shrubbery away from the house. Use baits to kill ants that have gotten into the home. Ant baits can be purchased at most home and garden stores. Following all label directions, place the bait where ants have been seen to travel. Apply insecticide around the perimeter of the home and under siding to help keep ants from crawling in. You can do this yourself or hire a pest control professional. Locate the ants' nests, if possible, and treat them with a properly labeled insecticide. In some cases, however, the ant species will have multiple colonies, so treating a single nest will not relieve the problem. Baits are the most effective product for ant control because the worker ants will carry it back to the nest to feed – and poison – the nesting ants, eliminating the colony in that nest. A broadcast application of insecticide (labeled for fire ants) can be used in lawn areas where multiple nests are located or wider control is desired. This can also be used as a preventive control against ants that attempt to move into the area while the chemical is active. These tend to be granular products that are applied with a push-type fertilizer spreader, then watered. If there are only one or two fire ant mounds, you may opt to treat each mound individually rather that with a broadcast application. However, this can take more time and may use more insecticide. Baits are not effective if the ant is nesting outdoors. Instead, the best option is to locate the nest and treat it directly. To locate a nest, follow the trail of ants backward from the food source. If the outdoor nest cannot be found, a perimeter treatment of the home can help to keep outdoor-nesting ants from coming indoors to forage for food – or set up new nests. Use bait, the most effective method. The worker ants will carry the bait back to the nest to feed — and poison — the nesting ants, eliminating the entire colony instead of just the foragers. Drenching of the nest is not an effective treatment for ants that expand their colonies through budding. At any disturbance or threat, the ants can bud, and if it has multiple queens, you can end up with multiple ant colonies instead of the one you started with. Ghost ant colonies have multiple queens and multiple nests, and are very mobile. Control is difficult because of the many nests that often make up a colony. Therefore, even a direct-nest spray treatment may not contact all members of all interrelated colonies. Like the pharaoh ant, ghost ants expand their colonies through budding. 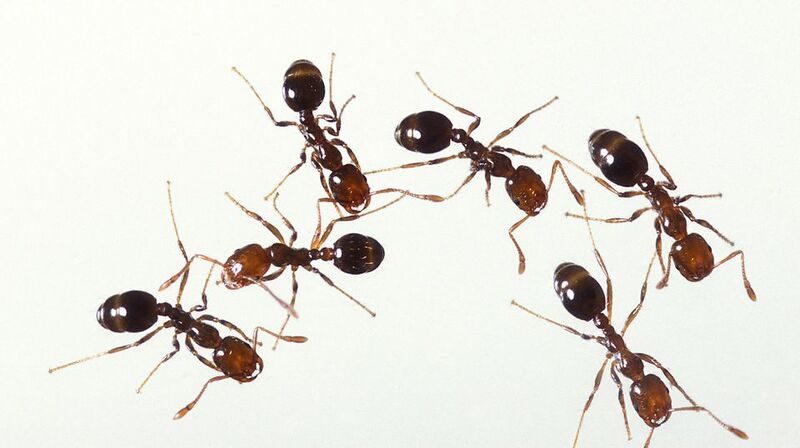 The same control techniques used for pharaoh ants are effective for ghost ants. Argentine ant colonies have many nets and many queens, numbering in the hundreds, with thousands of workers to tend them. Additionally, a colony that is eliminated within a structure will often soon be replaced by another colony. Therefore, it is critical that all Argentine ants in an area, both within and outside a building, be found and eliminated at once. Because Argentine ants expand through budding, control them using the same techniques used for controlling ghost ants or pharaoh ants. Completely saturate the ant mound with a pesticide labeled for mound application of field ants. Increase the amount of water, if necessary, so the insecticide completely penetrates the mound. Seal or repair of gaps, cracks or other ant entry points to help keep the ants out of your home. Apply non-repellent insecticide, labeled for this purpose, around the perimeter, up and along the foundation wall, around doorways and windows, and beneath siding. What is the Best Way to Get Rid of Odorous House Ants? How Do You Keep Winged Carpenter Ants Out of Your Home?